CALORIE CONTENT: Metabolizable Energy (ME) = 3,880 kcal/kg, 482 kcal/cup (calculated). Amounts are based on the use of a standard measuring cup. HIGH-QUALITY PROTEINS – Proteins are the building blocks of all living organisms. Protein is essential for all bodily functions including those of the brain, heart, skin, skeleton and many others. 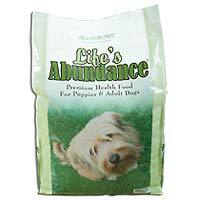 Life’s Abundance dog food contains at least 26% of high-quality protein. Look for identifiable animal proteins such as "chicken meal" rather generic terms like "poultry meal," which can consist of any fowl (turkey, chicken, geese, etc.). CHICKEN FAT - We believe the primary fat source in dog food should be animal based because these fats contain a profile of fatty acids that are easily metabolized and generally more available to the body. Animal fats can vary in quality, so look for a species-specific fat like “chicken fat” (versus “animal fat”) to be certain of the kind of fat your dog is eating.